Hope everyone had a peaceful weekend?? Its a new week and i just decided to drop this info for those still deciding on a data plan to buy. This will be a very nice plan for the iPhone/iPad users, and Android phone users who are finding it hard to coup with expensive data. This plan is working for all types of phones and PC, it is working 24/7 (day/night). At the beginning, this plan was N3,000 now it's price has been reduced to N2,500 which is fair enough for the subscribers. This should be a better alternative to MTN night plan, but as usual for my people that love Awoof (unlimited browsing) it is still available for only N600. Anonymous thnks too for stopping by. 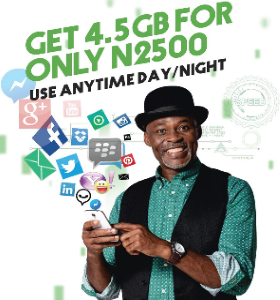 Thanks for finally talking about > "Glo 4.5GB for just N2500" < Liked it!